marital bless: Oh, it was good. From top left: Corn Dog, Veggie Fries, Turkey Sandwich, Fried Pickles, Roasted Corn, Raspberry and Pineapple Dolewhip, Strawberries and Cream, Boatload of Sunnies, Roasted Corn and Bacon Pizza. OMG, where did you go and what are boatland of sunnies? I want to go there... wherever it is. I need some veggie fries, roasted corn, raspberry dolewhip.... well everything! You are making me drool and want to go back to the Fair NOW! Those fried pickles (with the cream cheese) may be one of my new favorites. And where is the corn and bacon pizza? YUM! Fair food has never looked so good! LOVE!! Our fair is in two weeks and I can't wait! PS - what are sunnies? That pizza is my favorite. Is that the one where the guy makes it out of the back of his truck at the "drive-in"? Definitely getting the deep fried pickles, too. My favorite! We'll be there on Saturday night!! Yipee!!!!! After I skipped the Dole Whip last year I promised I would not leave the fair without it this year. Verdict? Best thing I ate all day! Seriously? 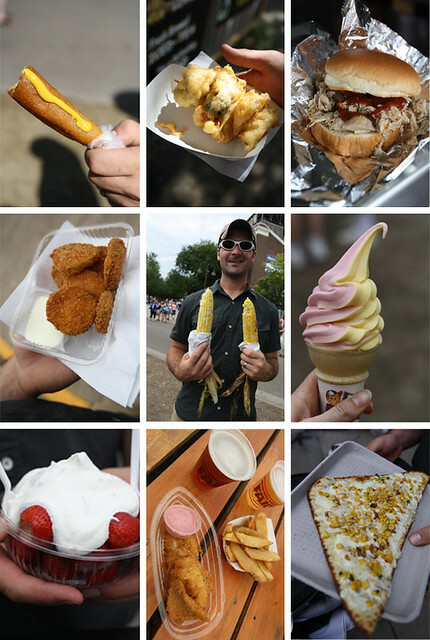 I wish we had fair food like this! Oh this is just mean. Holy yum! !